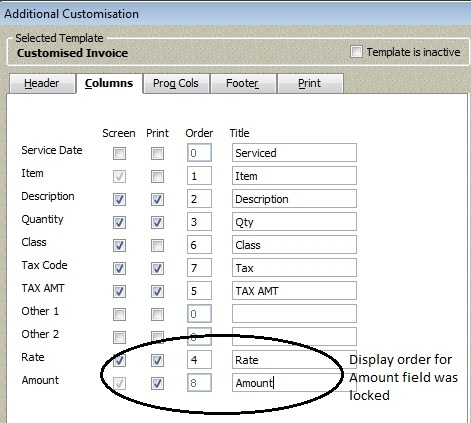 If you ever try customising your invoice template, you will notice that the order of the “Amount” column is locked. Some user prefers to have the Tax Code column position behind the Amount column; however, they can’t do it. Even if they were to try changing the order number of the Tax Code to be after or replaced order of the Amount column (such as “8”), QuickBooks will automatically change it back to the number before the Amount field. For those user who has been using the older version of QuickBooks with fields displayed after the Amount column in a customised template, you should not amend any field in the Columns tab after migrating your data to the latest version (if you want to keep the original setting). Once amended, the order of the Amount field will automatically change to the last column and locked. This entry was posted in QuickBooks, QuickBooks 2009/10, QuickBooks 2011/12, QuickBooks Asia, QuickBooks Australian version. Bookmark the permalink.